May 5th 1888 LUSC to locate a site and to communicate with the Earl of Derby over a site in Cheetham. Jan 31st 1889 Agreed plans and purchase form Committee at 1/- per yard for 999 year lease. Feb 28th 1889 Agreed price of £2,700. Feb 6th 1890 £9.10.0d for new telephone to new station. March 11th 1890 A strong earthen ware WC to be fixed in each cell with 3 gall cisterns, 1 ½ “ flushing pipe similar to those already in Canal Street. £127. April 1890 Contract now complete CC to take possession even though a second contract ongoing for additional cell WCs. June 19th 1890 Paving of Derby St required. Jan 8th 1891 Paving to Sherbourne St agreed under General Improvement Act 1857. July 23rd 1891 Twinquennial valuation of properties owned by the W.C only: £2,033. 19th May 1898 LUSC: cracks on wall at entrance to charge office observed on erection in 1889 only slight change since. Repair cracks and painting to front elevation. 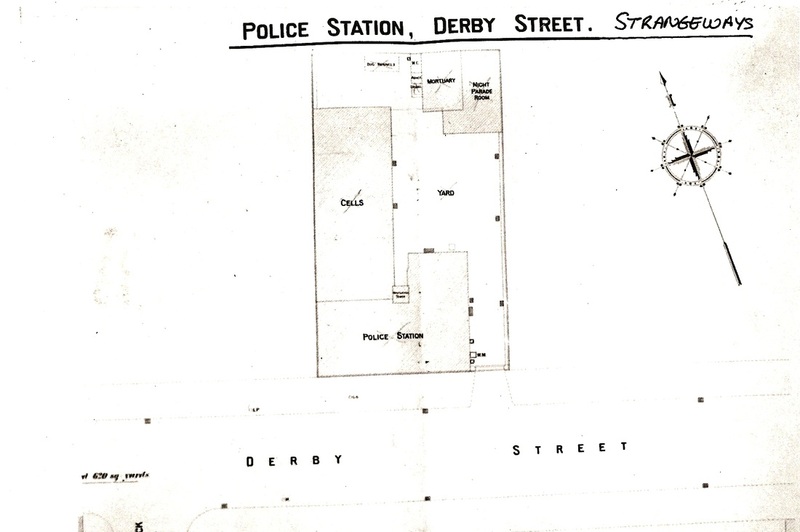 1st March 1900 Paving committee asking of any more land was required for this police station, informed there was not. 15th May 1901 Quinquennial Valuations: £1,922.